Everyone experiences frustrations and develops grudges, animosity, and even rage toward others. Often these feelings can build and build until they boil over. For most this usually only goes as far as an argument or a fight, but we’ve unfortunately seen how they can result in paroxyms of horrible violence. But what if for one day out of the year, all of society’s accumulated hostility could be released without consequences? What if America could enjoy a national day of catharsis? These are questions that The Purge asks but only seems half-heartedly interesting in exploring, focusing instead on delivering horrors of both the sociological and home invasion variety. Unfortunately the disconnect between these two goals and the blunt manner in which they’re approached lessen the impact of both. Most conjectures of the future seem to fall only into conceptions of utopia and dystopia. The screenplay here imagines a near-future America which is utopian 364 days of the year, with almost no unemployment, no poverty and no crime. Unfortunately, there are 12 hours each year, a period designated as the Purge, when laws no longer apply, emergency services are suspended and citizens are allowed to commit virtually every crime they wish, even murder, in an effort to exorcise their aggression and keep the peace for the remainder of the year. We witness this event through the viewpoint of one affluent family, the Sandins. Head of the family James (Ethan Hawke) has made his fortune selling home security systems that, given the lack of crime, are really only intended to be used one night a year. As a patriotic American, he’s a firm believer in the benefits of the Purge, a view his placid wife Mary (Lena Headey) does not challenge, but which his children Zoey and Charlie are less enthused about. As the family locks down their house for the night in question, Charlie, in a moment of compassion, disables the house’s security systems long enough to allow a wounded stranger (Edwin Hodge) into their home. Unfortunately, this brings down the wrath of an army of masked youths who surround the house and demand their intended prey be returned to them or else the Sandins will serve as their new target. The basic premise of the story, whether you believe its overall plausibility in providing social stability or not, offers a host of fascinating possibilities to explore, most of which the film doesn’t really go far into. This is a disappointment but not in itself a fatal one. It’s important to accept a movie for what it is rather than what you would prefer it to be and if writer and director James DeMonaco, who previously scripted the similarly siege-minded remake of Assault on Precinct 13 with Hawke, was only interested in using the concept to set up a scenario to generate suspense, that would be just fine. The problem is that DeMonaco clearly really wants to engage with the class-based aspects of the situation but does so a very clumsy and ham-handed manner. There’s interesting talk radio chatter early in the film suggesting the Purge actually serves as a way of cutting down on the defenseless lower classes and the homeless, thereby providing the economic benefits the government promotes. It's an interesting idea but one that's hammered home painfully and awkwardly when DeMonaco has the prep school-attired leader of the masked gang (Tony Oller) engage in long-winded and crushingly on-the-nose speeches about how the unnamed stranger is a lower-class pig who doesn’t appreciate that his place is to be slaughtered by the elite. Perhaps the most potentially creepy aspect of the story, the idea that even the more seemingly sane and normal person might be capable of terrible things if given a free pass to unleash their most basic violent impulses, is undercut by the fact that everyone who participates in the Purge is depicted as possessing an almost religious zealotry about it that borders on psychosis. It becomes much easier for the viewer to dismiss the more sinister psychological underpinnings of the concept when they can easily label the violent ones as crazy and stay content in the righteous belief that they would never engage in such horrors themselves. 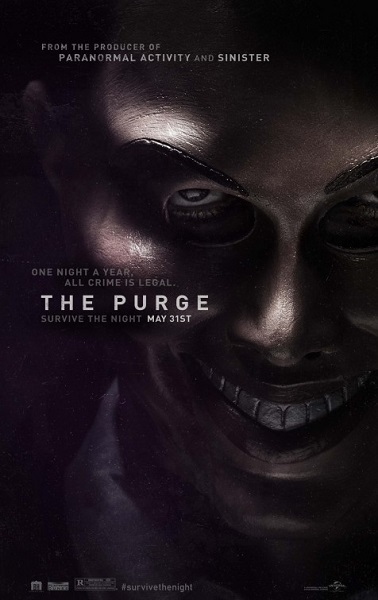 That said, when the main characters alude to this, making clear that while they support the purge, they don't participate because they don't feel the need, it does allow the film to function as a portrait of bystander syndrome. James' rationalizations about the social benefits of the purge really come down to a tacit approval of murder so long as it provides economic benefits, an idea that will feel all too familiar to many in everyday American life. As the carnage begins, he and his wife detachedly comment on their neighbors' activities and he cheerfully encourages his family to watch purge-related TV programming, a grimly hilarious and astute detail of how even crime can become entertainment, something happening somewhere else that one can smugly observe from the safety of their suburban fortress with a sense of moral superiority. It isn't until the violence comes to their doorstep that moral qualms begin to emerge. Hawke seems pretty willing to play to character's gaping moral blindspots, particularly during a tense stand-off when James begins spewing his own version of the masked assailants' justifications, insisting the stranger should be willing to leave the house and 'die like a man' so his family can survive. Hawke subtly suggests James' awareness of what a horrifically privileged view it is even as he's saying it. Thus, it's a bit of a disappointment when De Monaco seems reluctant to follow James' hypocrisy to its ultimate ends. The greater disappointment is that Lena Headey, an actress who excels at playing strong female characters such as Sarah Connor to Queen Cersei, is stuck playing a terrified and mostly passive housewife. While she finally gets the chance to take some important action in the third act, her character isn't built up enough to make the transition work. The same applies to Hodge as the stranger. From the few clues we get about him, such as the dog-tags indicating military service, one can imagine an alternate and potentially more interesting take on the plot from his point-of-view, or that he could at least offer a different perspective on the situation as it relates to the class divide. Instead he's reduced to serving as a symbol of the victimized poor and, to paraphrase what Oller's gang leader insists, only exists to serve the needs of the upper-class, in this case as plot device and motivator. As Zoe, Adelaide Kane has little to do but play peril monkey as things get tense while Max Burkholder as Charlie is similarly let down by a failure of character building. Given that the story hinges on his act of compassion, the movie really would benefit from one good scene in which he and his father have it out regarding their differing views. Even the efforts at suspense are disappointing as we get endless scenes of our characters stalking through darkened hallways with flashlights and guns, waiting for something to jump out. Meanwhile, masked assailants hover in the corners or background, moments that only serve to remind us how much more effectively The Strangers played the same tricks years before. The build-up at least pays off in one viscerally effective fight scene in which a character is pitted against several of the intruders at once, leading to a primal and gory expression of the survival instinct latent in even the most civilized suburbanite. I feel some qualms about being so tough on this one, as there is so much potential in the idea and I admire De Monaco's efforts to elevate a simple suspense thrill into something more. Plus I always like to see smaller-scale productions (the budget was surprisingly only $3 million) succeed with audiences as this one has. But I've found after seeing it that discussions with friends about the imagined reality of The Purge have proven to be much scarier and more engaging than the film that actually depicts it.